Early update. Apple already updates the MacBook Pro 13 after around 8 months. Modern Kaby Lake processors and faster SSDs are supposed to provide more performance. But did the manufacturer fix some issues of the predecessor? Update: The review is now complete. Model: The Apple MacBook Pro 13 2017 looks identical to last year's version, with its thin, low-profile aluminum design. The laptop comes in space gray or silver. Weighing 1.36 kg (3 pounds) and 1.52 cm (0.6 inch) thick, the MacBook Pro is heavier than the Dell XPS 13 (1.22 kg/2.7 pounds, 1.52 cm/0,6 inch) and the Lenovo ThinkPad X1 Carbon (1.13 kg/2.5 pounds, 1.52 cm/0.6 inch), and slightly thicker than the 13-inch HP Spectre x360 (1.32 kg/2.9 pounds, 1,27 cm/0.5 inch). For display, the MacBook Pro's 2560 x 1600-pixel display is a beauty, offering eye-popping color and sharp clarity. It results in a pixel density of 227 PPI. 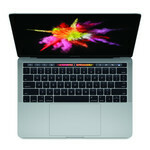 Emitting up to 458 nits (a measure of brightness), the MacBook Pro's screen also outshines the competition. That mark tops the 288-nit ultraportable average. As for the keyboard, the MacBook Pro's backlit keyboard, trackpad, and Touch Bar offer solid input experiences, but they may take some getting used to. While the keys have only 0.7 millimeters of travel, they make up for it by requiring 74 grams of force (above 60-gram standard) to actuate. The 5.3 x 3.3-inch (13.46 x 8.38 cm) Force Touch trackpad provided accurate tracking. Because it's a nonmoving input surface that sends haptic feedback, the pad doesn't offer much of a clicking feel by default. Dragging and dropping objects, though, works differently than on any other notebook, requiring the user to use a half press before dragging objects. The MacBook Pro 13 with the Touch Bar is once again the more powerful model out of the two 13-inch systems since Apple uses dual-core processors with a TDP of 28 W. This is an advantage for the GPU in particular because the higher consumption limit gives more headroom for the Turbos of the two components. Under the hood, this MacBook Pro's 7th-Gen Intel Core i5-7267U CPU, coupled with 8 GB of RAM, enables serious multitasking. The 512 GB PCIe NVMe SSD in the MacBook Pro duplicated 4.97 GB of multimedia files in 7 seconds, for a speed of 727 MBps. That's much faster than the 200.83-MBps average for ultraportables. The Intel Iris Plus Graphics 650 in the MacBook Pro supports modest gaming, too. The gaming performance of the Intel Iris Plus Graphics 650 is between the two dedicated chips Nvidia GeForce 930MX and 940MX, depending on the game. The MacBook Pro features speakers filled our large conference room with sound, drowning out our loud air conditioning. While audio pros likely have high-end headphones and speakers to connect to, this notebook offers some of the best sounds ever heard come from an ultraportable. With four Thunderbolt 3 ports (split between its left and right sides) and a headphone jack, the MacBook Pro shows that Apple's future-facing view still requires a user to buy dongles to plug in our pre-existing devices. Intel Iris Plus Graphics 650: Integrated graphics card (GT3e), which is used for some Kaby Lake CPUs (28 Watts). Modern games should be playable with these graphics cards at low settings and resolutions. Casual gamers may be happy with these cards. » Further information can be found in our Comparison of Mobile Graphics Cards and the corresponding Benchmark List. 7267U: Kaby-Lake based SoC (System on a Chip) for medium-sized notebooks. Integrates two CPU cores clocked at 3.1-3.5 GHz as well as an Iris Plus Graphics 650 GPU clocked at 300 - 1050 MHz and 64 MB eDRAM. Manufactured in a 14nm process. The TDP of 28 Watts is pretty high for a dual-core processor.» Further information can be found in our Comparison of Mobile Processsors. 81.03%: This rating should be considered to be average. This is because the proportion of notebooks which have a higher rating is approximately equal to the proportion which have a lower rating.